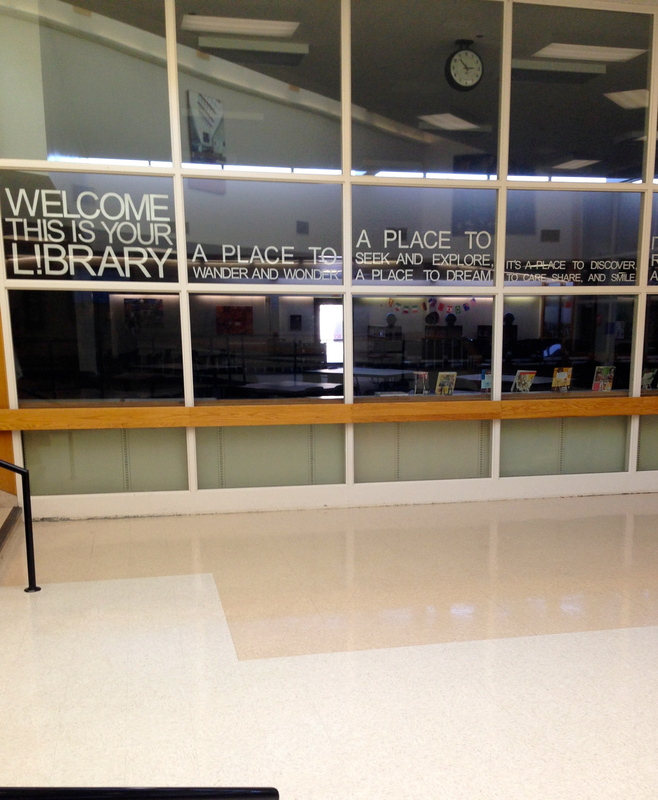 Since I last posted on this blog, I have moved to a new school and a new library. I left a beautiful, newly-built school library with great display areas, huge windows and light, new furniture and a big-budget book collection. 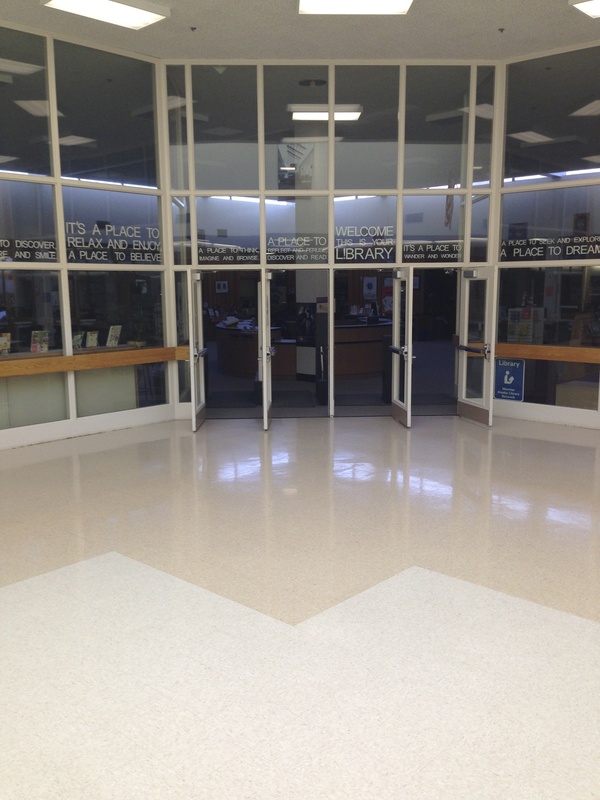 This new library is shared by a high school and middle school- it bridges the two schools together, but is located down a long hallway between the two facilities. Foot traffic is basically nil. The collection and the space have to work for the squirrelly 7th grader as well as for the jaded and cool 12th grader. When my assistant (who thankfully transferred with me) and I walked into this huge 10,000 sq. ft space, it was a throwback to 60’s era decor and was cluttered with books and equipment from that era as well. The first half of the year was divided between cleaning and rearranging the space, and making the collection more easily accessible through relabeling and arrangement. Literally thousands of books were weeded from the collection. 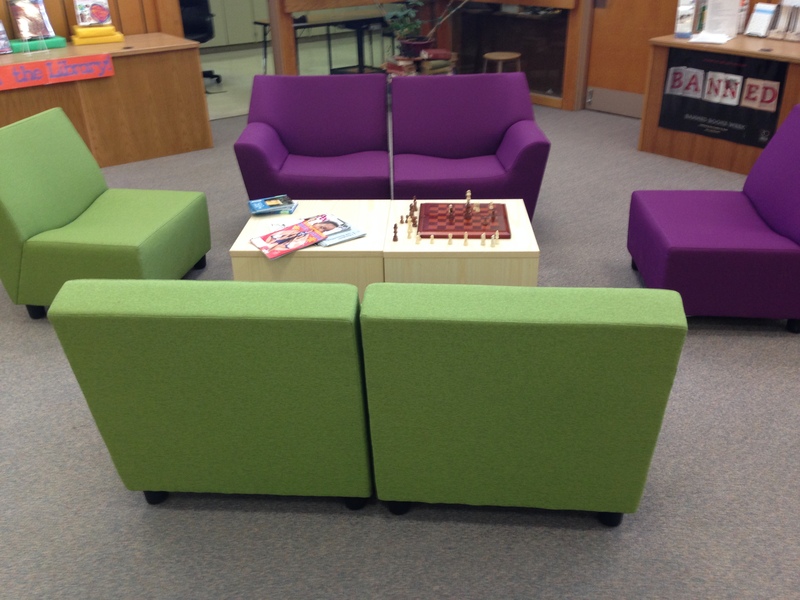 Early in the year there was grant money to purchase some library furniture and we knew just what was needed. 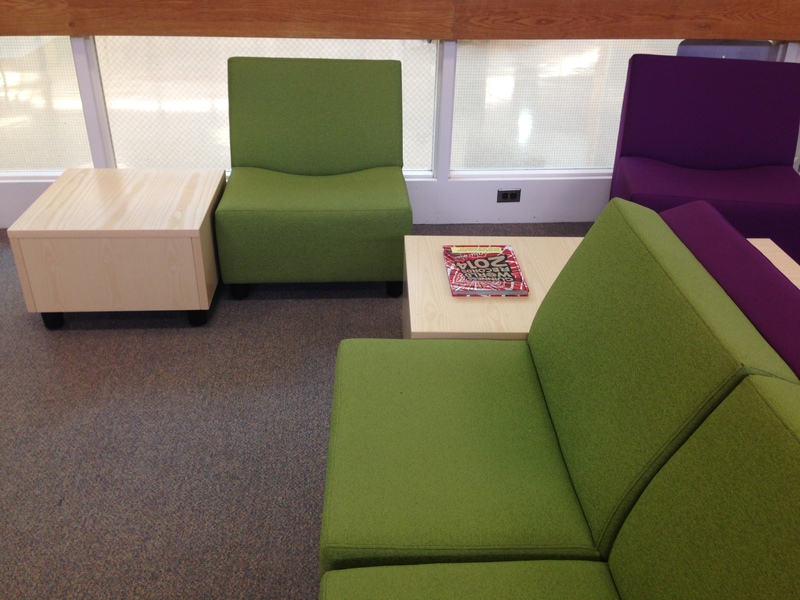 With all the tables and areas for classes and smartboard presentations, it felt like we needed non-work areas. So we bought some Herman Miller modular chairs in bright colors from the Swoop Lounge collection, moved some shelves, got some chessboards and puzzles and created a couple areas for just hanging out and relaxing. The students, even the jaded ones, took to the areas immediately. There wasn’t much time for the frivolous pursuit of library displays. But in March, we finally caught our breath and found some inspiration. We found an inspriational quote on Pintrest that was used on the front doors of a library. 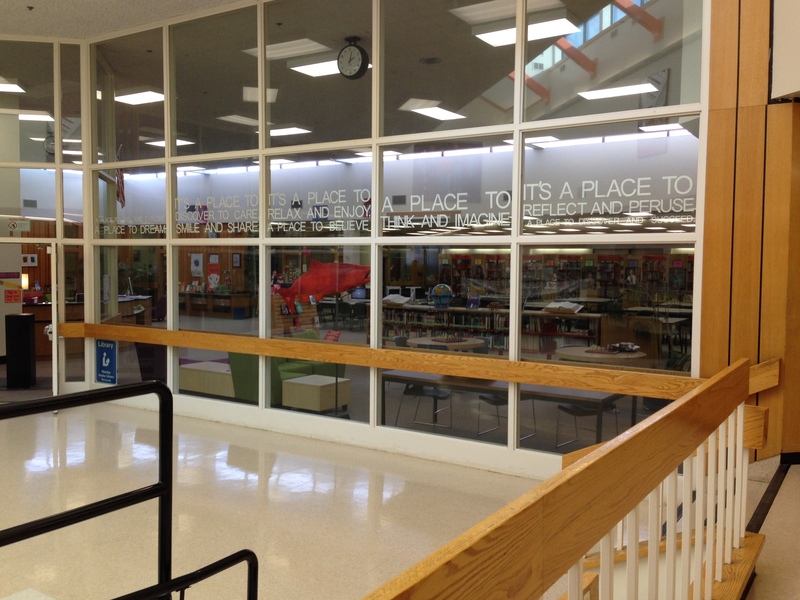 We modified it and ran it along the front windows of our library. We used laminated paper in our VariQuest computerized die cut machine to cut out the letters in white, giving it the feel of etched glass. It took one whole in-service day plus another few to complete the project, but we love the result. The pictures don’t really do it justice. Welcome. This is your L!brary. It’s a place to wander and wonder. It’s a place to seek and explore. A place to dream. It’s a place to discover, to care, smile and share. It’s a place to relax and enjoy. A place to believe. It’s a place to think, imagine and browse. A place to reflect and peruse, discover and succeed. It’s been a great new beginning. 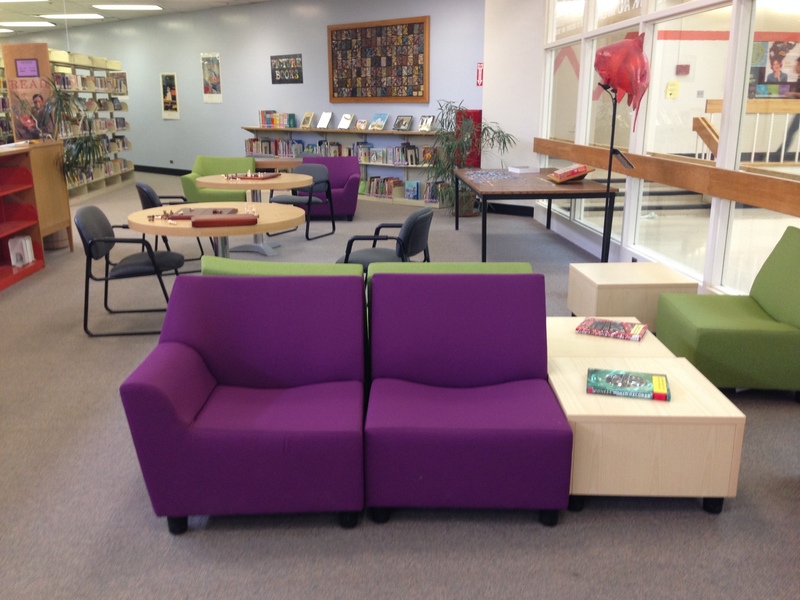 Hi Stacy we are looking for new chairs for our library I really like the chairs purple and green ones could you forward where you purchased them at and their phone number. The quote is gorgeous! I’m totally inspired! How did you affix the letters to the windows? Thanks! We attached the top half of the letters to a strip of book tape, and then *carefully* taped the entire strip to the window. It was a challenge to get them even and definitely a two-person job! We are curious – would you buy this furniture again? Has it held up well? Is it comfortable? 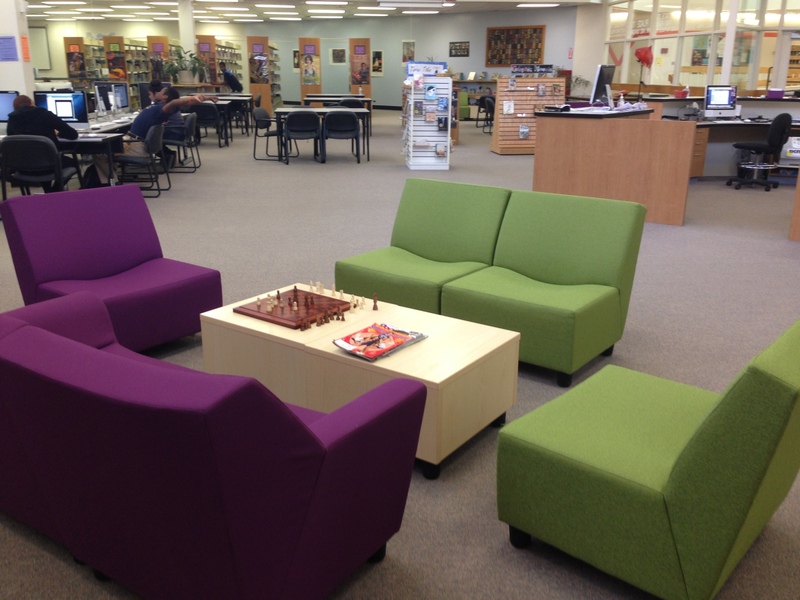 The furniture that was purchased for our library looks attractive and modern – but the first comment people make is some version of “Wow! This is really hard”. They feel like a hard park bench without the back and are uncomfortable. Some days, we really just want our ugly old but comfy couches back!